For integrated circuit diagrams, see Floorplan (microelectronics). For the financial term, see Retail floorplan. In architecture and building engineering, a floor plan is a drawing to scale, showing a view from above, of the relationships between rooms, spaces, traffic patterns, and other physical features at one level of a structure. 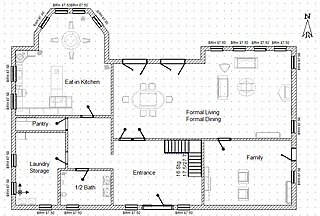 It is also called a plan which is a measured plane typically projected at the floor height of 4 ft (1.2 m), as opposed to an elevation which is a measured plane projected from the side of a building, along its height, or a section or cross section where a building is cut along an axis to reveal the interior structure. 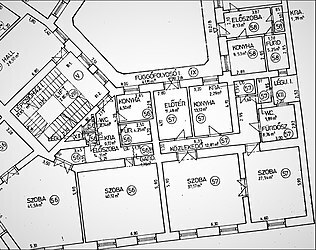 Floor plans use standard symbols to indicate features such as doors. This symbol shows the location of the door in a wall and which way the door opens. A plan view is an orthographic projection of a three-dimensional object from the position of a horizontal plane through the object. In other words, a plan is a section viewed from the top. 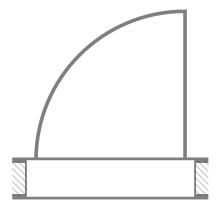 In such views, the portion of the object above the plane (section) is omitted to reveal what lies beyond. In the case of a floor plan, the roof and upper portion of the walls may typically be omitted. Whenever an interior design project is being approached, a floor plan is the typical starting point for any further design considerations and decisions. A plan is a common method of depicting the internal arrangement of a three-dimensional object in two dimensions. It is often used in technical drawing and is traditionally crosshatched. The style of crosshatching indicates the type of material the section passes through. 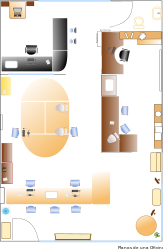 A 3D floor plan can be defined as a virtual model of a building floor plan. 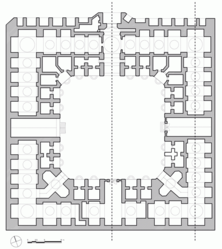 It is often used to better convey architectural plans to individuals not familiar with floor plans. Despite the purpose of floor plans originally being to depict 3D layouts in a 2D manner, technological expansion has made rendering 3D models much more cost effective. 3D plans show a better depth of image and are often complimented by 3D furniture in the room. 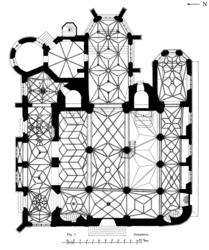 This allows a greater appreciation of scale than with traditional 2D floor plans. ^ Site Plans, Elevations and Floor Plans Archived 2010-06-07 at the Wayback Machine A Community Guide San Jose. Accessed 11 February 2009.